Fort Worth, Texas — A total of six collegiate players, one college president, 14 college coaches, 12 college and university administrators, two college referees and three programs have been nominated for the 2017 Armed Forces Merit Award presented by the Football Writers Association of America (FWAA). With 38 nominations to be considered, the award’s selection committee of five FWAA members and two representatives from the Lockheed Martin Armed Forces Bowl will determine the 2017 recipient. Lockheed Martin Armed Forces Bowl Executive Director Brant Ringler and FWAA President David Jones of the PA Media Group (Downingtown, Pa.) will make the announcement the week of Nov. 5. 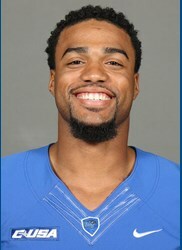 Steven Rhodes, a defensive lineman at Middle Tennessee State University and four-year letterman for the Blue Raiders, was the 2016 recipient. Nate Boyer of the University of Texas was the initial recipient in 2012. Other honorees have been Brandon McCoy of the University of North Texas in 2013, Daniel Rodriguez from Clemson University in 2014 and Bret Robertson of Westminster College (Fulton, Mo.) in 2015. FORT WORTH, Texas — U.S. Marine veteran Steven Rhodes, a senior defensive end at Middle Tennessee State University, is the fifth recipient of Armed Forces Merit Award presented by the Football Writers Association of America (FWAA). 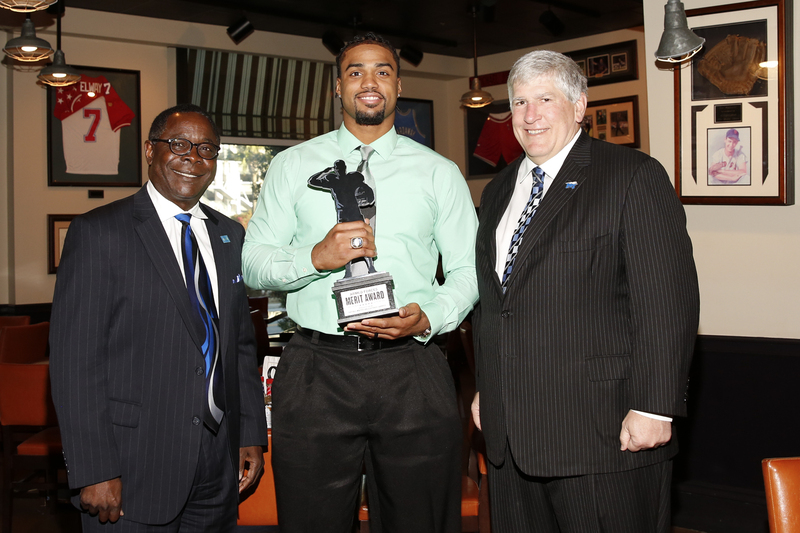 Brant Ringler, the executive director of the Lockheed Martin Armed Forces Bowl, and Steve Richardson, the FWAA’s executive director, announced here Friday that Rhodes, who will be 28 in 11 days, is the 2016 recipient. A seven-person committee made up of FWAA members and Lockheed Martin Armed Forces Bowl officials selected Rhodes from a list of 16 nominations for the 2016 award. Nate Boyer of the University of Texas was named the initial recipient of the award in 2012, followed by Brandon McCoy of the University of North Texas in 2013, Daniel Rodriguez from Clemson University in 2014 and Bret Robertson of Westminster College (Fulton, Mo.) in 2015. All four individuals were U.S. Army veterans before playing college football. A 6-foot-3, 260-pound defensive end and fourth oldest player in the Football Bowl Subdivision, Rhodes is the team’s eighth leading tackler with 29 total stops (18 unassisted), with 4.5 tackles for losses, 2.5 sacks, two pass deflections, five quarterback hurries, one forced fumble and one fumble recovery. For his career, Rhodes has 98 total tackles (63 unassisted). Following graduation in 2007 from Antioch (Tenn.) High School where he played football, Rhodes enlisted in the Marine Corps as a shoulder injury and financial issues initially kept him from attending college. Rhodes’ “road” back to college football started three years ago when he was stationed at the Marine Corps Air Station in New River, N.C. When he was moved to MCAS Miramar, Calif., he started for the Miramar Falcons in 2012. ESPN Events, a division of ESPN, owns and operates a large portfolio of collegiate sporting events worldwide. The roster includes three Labor Day weekend college football games; FCS opening-weekend game; 13 college bowl games, 11 college basketball events and two college award shows, which accounts for approximately 250-plus hours of programming, reaches almost 64 million viewers and attracts over 700,000 attendees each year. With satellite offices in Albuquerque, Birmingham, Boca Raton, Boise, Dallas-Fort Worth, Honolulu, Las Vegas, Montgomery and St. Petersburg, ESPN Events builds relationships with conferences, schools and local communities, as well as providing unique experiences for teams and fans. ESPN Events also manages the Big 12 Corporate Partner Program. Collegiate Football — AdvoCare Texas Kickoff (Houston); AdvoCare V100 Texas Bowl (Houston); Air Force Reserve Celebration Bowl (Atlanta); Birmingham Bowl (Alabama); Boca Raton Bowl (Florida); Camping World Kickoff (Orlando, Fla.); Famous Idaho Potato Bowl (Boise); Gildan New Mexico Bowl (Albuquerque); Hawai’i Bowl (Honolulu); Las Vegas Bowl (Nevada); Lockheed Martin Armed Forces Bowl (Dallas-Fort Worth); MEAC/SWAC Challenge (Baton Rouge, La. ); Montgomery Kickoff Classic (Montgomery, Ala.); Popeyes Bahamas Bowl (Nassau); Raycom Media Camellia Bowl (Montgomery, Ala.); St. Petersburg Bowl (Florida); The Home Depot College Football Awards (Atlanta) and Zaxby’s Heart of Dallas Bowl (Dallas-Fort Worth). Collegiate Basketball — AdvoCare Invitational (Walt Disney World Resort near Orlando, Fla.); College Basketball Awards Presented by Wendy’s (Los Angeles); Gildan Charleston Classic (South Carolina); Hawaiian Airlines Diamond Head Classic (Honolulu); Jimmy V Men’s Classic presented by Corona (New York City); Jimmy V Women’s Classic presented by Corona (Uncasville, Conn.); NIT Season Tip-Off (Brooklyn, N.Y.); PK80 (Portland, Ore.); State Farm Armed Forces Classic (Honolulu); State Farm Champions Classic (New York City); Tire Pros Invitational (Orlando, Fla.) and Wooden Legacy (Orange County, Calif.). For more information, visit the official website, Facebook, Twitter or YouTube pages. The Football Writers Association of America (FWAA, http://www.sportswriters.net) consists of the men and women across North America who cover college football for a living. Founded in 1941, the membership includes journalists, broadcasters and publicists, as well as key executives in all the areas that involve the game. The FWAA works to govern areas that include game day operations, major awards and an All-America team. Through its website, the FWAA works to improve communication among all those who work within the game. The FWAA also sponsors scholarships for aspiring writers and an annual writing contest. Behind the leadership of President Mark Anderson of the Las Vegas Review-Journal, Executive Director Steve Richardson and a board of veteran journalists, the FWAA continues grow and work to help college football prosper at all levels. There are now over 1,300 members. FORT WORTH, Texas — Led by 2015 runner-up Steven Rhodes of Middle Tennessee State University, four individuals and the Kansas State football program have been named as finalists for the 2016 Armed Forces Merit Award presented by the Football Writers Association of America (FWAA). Other finalists for the 2016 AFMA are Fran McMenamin, a Marine veteran playing on the offensive line at East Stroudsburg University, Naval Academy outside linebacker coach and Marine Robert Green as well as Texas Tech strength and conditioning coach and Army veteran Rusty Whitt. The partnership between the K-State football team and the 1st Armored Brigade Combat Team brought Soldiers and players together at Fort Riley June 17 for a joint physical readiness training event. Kansas State has been involved with Fort Riley since 2008. The award’s selection committee is made up of five FWAA members and two representatives from the Lockheed Martin Armed Forces Bowl. The group reviewed 16 “candidates” for the 2016 honor where Rhodes, McMenamin, Green, Whitt and the K-State football program were confirmed finalists for the award. This year’s recipient will be announced this Veteran’s Day, Nov. 11. The announcement of the 2016 recipient will be made jointly by Lockheed Martin Armed Forces Bowl Executive Director Brant Ringler and FWAA President Mark Anderson of the Las Vegas Review-Journal on an 11 a.m. (CT) teleconference. Nate Boyer of the University of Texas was named the initial recipient of the award in 2012, Brandon McCoy of the University of North Texas topped the AFMA list in 2013 and Daniel Rodriguez from Clemson University was honored in 2014. FORT WORTH, Texas — Daniel Rodriguez, a senior wide receiver and special teams player at Clemson University, is the third recipient of Armed Forces Merit Award presented by the Football Writers Association of America. Selected by a seven-person committee made up of representatives from the FWAA and the Lockheed Martin Armed Forces Bowl, Rodriguez joins Nate Boyer of the University of Texas and Brandon McCoy of the University of North Texas as recipients of the Armed Forces Merit Award presented by the FWAA. Boyer, who is completing his third-season as the long snapper for the Longhorns, was honored in 2012 while McCoy was the 2013 recipient during his fourth and final season as a defensive lineman for the Mean Green. Rodriguez, 26, was an Armed Forces Merit Award semi-finalist both years while playing at Clemson, where he was the 2012 recipient of the Orange Bowl-FWAA Courage and USAA Athletic Inspiration Awards and an ESPY finalist for the Jim Valvano Perseverance Award.